Put Our Digi Detectives to Work! Our peeps at Divas’ Detectives have a fun job. Truthfully, it’s more fun than job! If you have been looking for the perfect kit to scrap your latest event but just haven’t been able to find it, no worries, let us help. We’ve all been there, we’re looking for the perfect kit, color or theme but just can’t seem to find it. Well you’ll be happy to know we’ve recognized the need and provided a resource to help. Join Divas’ Detectives Facebook group here, tell us what you’re looking for and members of the group will point you in the right direction. Of course, once you’ve joined the group you can also help others find just what they’re looking for. You see scrapbookers are a very generous group and love to help each other. So head on over and join the group, you’ll be glad you did. This entry was posted in Uncategorized on March 30, 2014 by Yobeth. Our Facebook Group Continues to Grow! Digi scrappers every where love our Facebook freebies group which continues to grow! We all love to add to our stash but it can get costly unless you take advantage of all the freebies out there. Many designers give away products made using their scrapbooking kits. It’s a great marketing tool to get you to try their product and hopefully buy more. Our group gather freebies from around the world and brings it all together for you. So if you haven’t already joined, don’t fret, you still have time. Click here to join and start building your stash without blowing all your cash! This entry was posted in Deals, Digi Scrapping Freebies Group, Facebook Group, Freebie on March 28, 2014 by Yobeth. Wow! I can not believe it is March already. Time is flying by at warp speed. 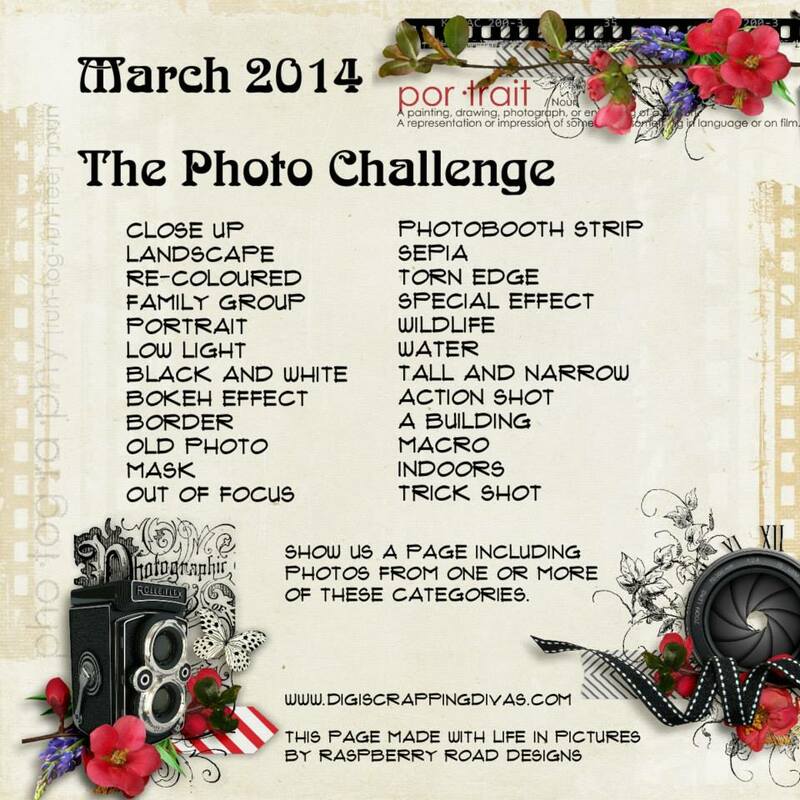 A new month means a new Photo Challenge in our Digi Scrapping Divas Facebook group. As you can see, this month’s challenge is about photos. The object is to make layouts using one or more of the challenge words. You can make as many layouts, with as many combinations, as you like. Then post your layouts in the albums created for this month’s challenge. After you post a layout simply make a comment on it then it will post to the page for everyone to see. You’ll feel the love as other scrappers in the group oooohh, aaaahhh and sometimes lift your fabulous work. If you haven’t already joined the group, what’s the hold up? We actually have several groups, check them all out here. This entry was posted in Challenges, DigiScrappingDivas and tagged digi scrapping divas, monthly challenge, photo challenge on March 1, 2014 by Yobeth.